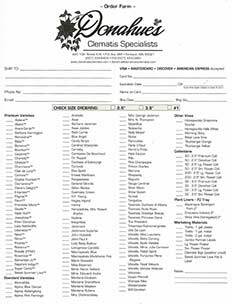 Ordering from Donahue’s can be done through one of the many brokers who sell our clematis or contact us directly. Contact us by phone: (507)-334-8404, fax: (507)-334-0485, or email: knass@donahuesclematis.com with any ordering questions. Be sure to check out our most current availability. During busy times of the year product availability may change several times a week.